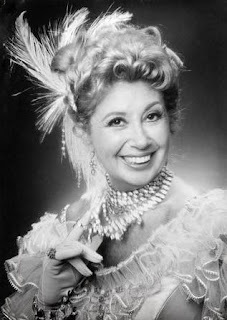 A Liberal's Libretto: "For those who admire it..."
"For those who admire it..."
Here's an update on a previous post regarding the auction of the estate of Beverly Sills. NEW YORK — An auction of the late soprano Beverly Sills' estate fetched more than a half-million dollars Wednesday — far more than expected for the costume designs, art and other personal items. Sills died in July 2007 after being diagnosed with inoperable lung cancer. On the block at Doyle New York auction house were more than 460 lots from the soprano's home overlooking Central Park. With a standing-room-only crowd of fans competing against bidders on the Internet and telephone, the auction's total of $519,075 exceeded the pre-sale estimate of about $253,000 to $378,000. The auction house did not disclose who would benefit from the proceeds of the sale. The highest price, $27,500, went for a pencil on paper sketch of a family by Fernando Botero, the Colombian artist noted for the exaggerated proportions of his figures. About 70 opera-costume sketches that Sills displayed in her apartment — going for up to $3,400 each — had escaped a 1985 fire that destroyed the actual clothing at a New Jersey warehouse used by the New York City Opera, the musical launching pad for Sills' international career. Among other auctioned items was a photo of Sills as Queen Elizabeth that graced a 1971 cover of Time magazine, which called her "America's queen of opera." The photo sold for $437. A collection of forty-five opera scores she used — many with her notations or inscriptions by friends and composers — went for $8,750. And the diva's two full-length Russian sable coats sold for $5,625 and $2,813. The prices include the auction house premium of 25 percent. Sills first performed with City Opera in 1955 and made her Metropolitan Opera debut in 1975. After her retirement from singing in 1980, Sills became City Opera's general director, then served as chairwoman of Lincoln Center for the Performing Arts and later as the Met's chairwoman. She was a powerhouse on the American cultural scene, hosting TV broadcasts and raising funds for both the arts and people with disabilities. Her daughter, Muffy Greenough, suffers from multiple sclerosis and was born deaf and son Bucky Greenough is autistic. To view some of the sold items and to also view pictures of the exhibition, be sure to check out the Doyle New York link. Associated Press.